Why are security deposits present in both the asset as well as the liability side of the balance sheet? How should an investor from non-finance background understand the business/accounting language used in the annual reports? At the end of each financial year, every company is required by law to prepare a report for shareholders, which provides the details of performance of the company over the year. 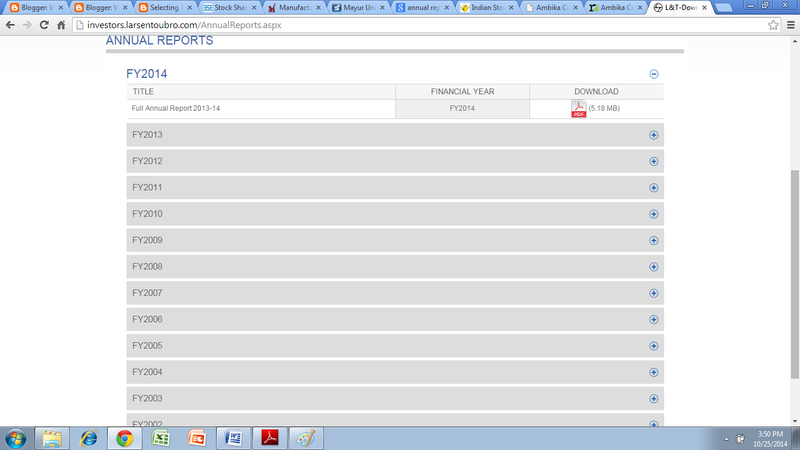 This report is called annual report. Annual report is the single most important source of information for an investor. Importance of annual report to an investor is akin to alphabets for any language or periodic table for Chemistry. 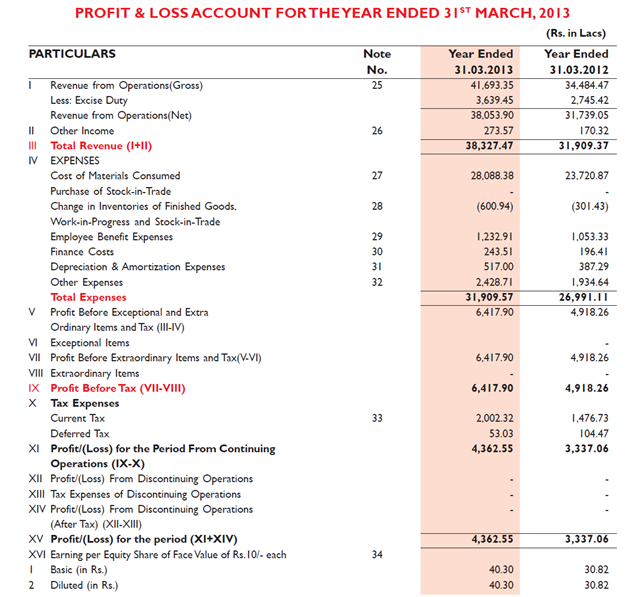 The detailed analysis of any company starts with reading of the annual report of the company. I believe that if an investor does not read annual reports of companies, she would not be able to become a successful investor. An individual investor can get annual reports of any company from multiple sources. These sources are free as well as paid sources. This is the most common source and should be the first place to look for information about any company. Many companies provide annual report for almost 10-12 years on their website. Below is the screenshot of investor’s section on website of Larsen & Toubro Ltd, which provides annual reports from 2002 onwards. Most of the companies, which lack annual reports on their websites, are small-cap and mid-cap companies, which are yet to have an investor friendly interface. As these companies grow in size, they start investing in public relations & investor friendly initiatives and improve significantly in dissemination of information. Therefore, the absence of annual reports on the website should not be seen negatively. It should be accepted merely as a phase in company’s life cycle. There are many other public sources from where we can get the required information. Some of such sources are mentioned below. 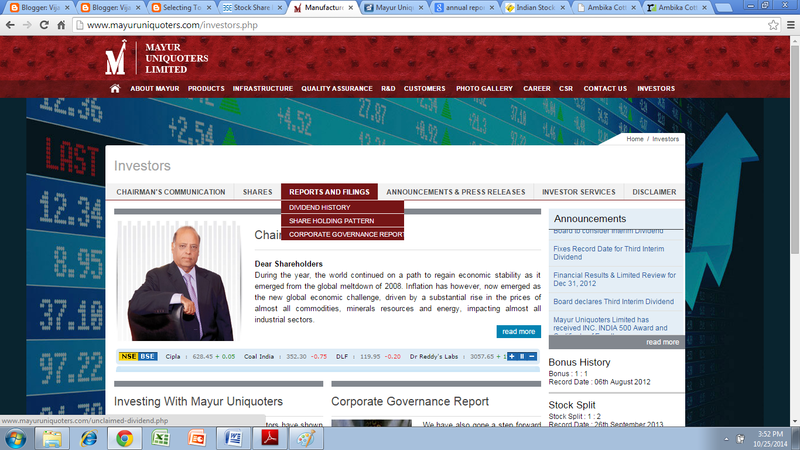 As we can see above, the annual reports of MUL are available on website of BSE. Therefore, an individual investor can get the annual reports of the companies that do not provide annual reports on their websites, from websites of stock exchanges. 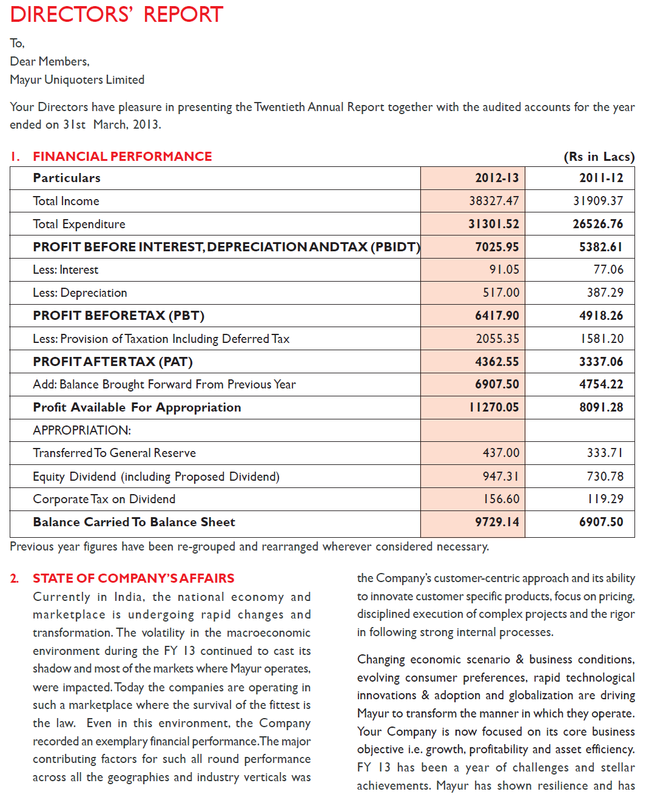 Annual report provides yearly account of performance of a company. We should read the annual report of a company with same vigor be it when analyzing it for investment for the first time or when monitoring it as part of our portfolio. While analyzing companies for first time investment, I prefer reading annual reports going back as far as possible, preferably for last 10 years or more. Annual report contains financial as well as non-financial information about the company. Both financial and non-financial information are equally important for investors. Annual report is an yearly occasion when owners/managers communicate with the shareholders and inform them about the vision of the company, its performance during past year, its achievements, hurdles & challenges being faced, steps taken to overcome such hurdles, status of past expansion plans & other projects undertaken by the company etc. Many promoters take this opportunity very seriously and inform the shareholders about the company and their philosophy in such details that their communications become a collector’s affair. Warren Buffett is one such person. His letters to shareholders of Berkshire Hathaway as part of annual report are read by investors world over. I would suggest that every person who wishes to be a successful investor in stock market should read all his letters. The communication of a company’s management to its shareholders is a very important source for judging the status of the company as well as the industry. In fact, whenever I want to know about the status of any industry, I read the annual report of any company belonging to that industry. One reading of management’s communication and the Management Discussion & Analysis (MDA) section would give an investor an authentic brief snapshot about the industry and the company. In this section, the directors as representatives of shareholders intimate them about the financial performance of the company during past year, status of projects under implementation, major customers, status of conversion of new customers, other major initiatives taken by company. We should analyse the current performance of the company by comparing it with the outlook presented by directors in past years in the annual report. Special focus should be on the projects under implementation. We should check whether company is able to finish projects on time and whether the company has abandoned projects midway. 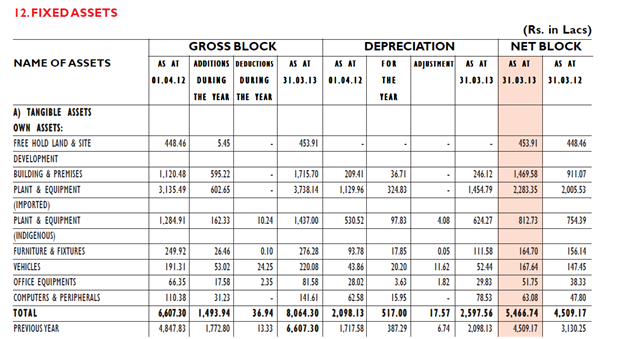 I have provided below a snapshot of the director’s report from the FY2013 annual report of MUL. 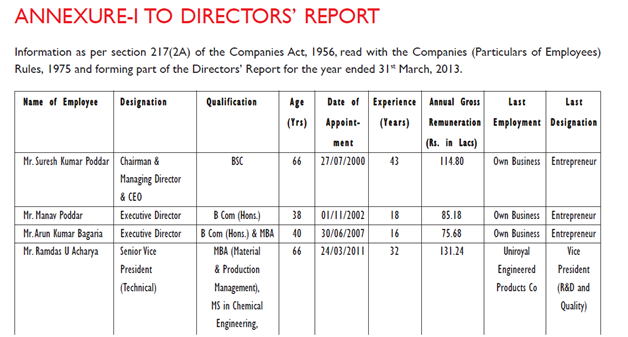 We get to know about the salary being drawn by most of promoter directors in this section. We can analyze whether salary drawn is in line with the industry norms/profits of the company. This would contain the information about the upcoming AGM as well as different decisions that require shareholder’s ascent by way of a vote. We get to know of salary hike sought by promoter managers, plans of taking further debt, new expansion projects, entry of next generation of leaders in board positions etc by the items listed to be voted in AGM. The financial section starts with the report of an independent auditor in which an independent entity provides its views about the financial information presented in the annual report. Auditor’s report comments on the key items like any deviation from the accepted accounting practices, any amounts that are not paid to government authorities, any default in payments to lenders, sufficiency of control systems to the size of the company, any frauds conducted by company or its employees, proper utilization of funds raised by company from lenders/IPOs etc. Auditor’s report gives you a snapshot of authenticity of financial information that follows in the annual report. These consist of three important sections: balance sheet, profit and loss statement and cash-flow statement. Financial statements of current year are always shown in parallel to figures of previous year so that performance of current year can be compared with immediately preceding year. We can see the comparative position of MUL at March 31, 2013 & March 31, 2012 and observe the way the balance sheet size has increased from Rs. 15,850.16 lakh (Rs. 1.58 billion) to Rs. 21,349.20 lakhs (Rs. 2.13 billion). Almost half of the increase of Rs. 5,499.04 lakhs (Rs. 0.54 billion) has been contributed by increase in reserves & surplus by Rs. 2,700 lakhs (Rs. 0.27 billion). This is a sign of healthy growth by a company. We can see that total revenues have grown by 20% from Rs. 31,909.37 lakh (Rs. 3.19 billion) in FY2012 to Rs. 38,327.47 lakh (Rs. 3.83 billion) in FY2013. Such revenue growth is very good. On top of it, we can see that in the same period net profit has grown by 30% from Rs. 3,337.06 lakh (Rs. 0.33 billion) in FY2012 to Rs. 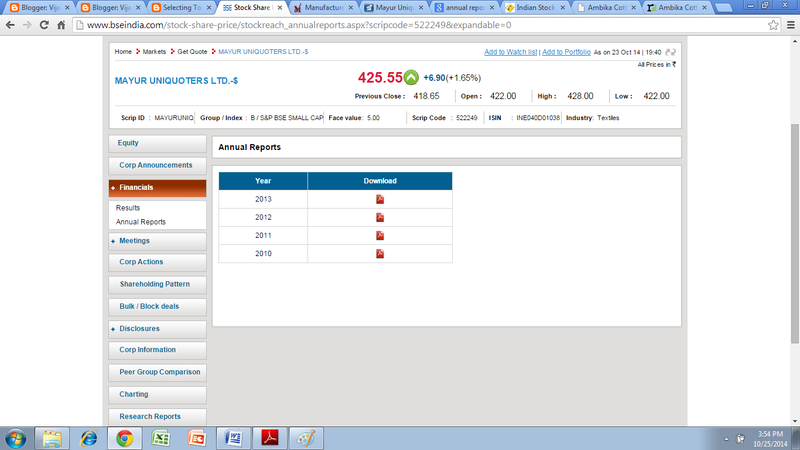 4,362.55 lakh (Rs. 0.44 billion) in FY2013. This higher growth in net profit is an indication of improvement in operating efficiency of the company. 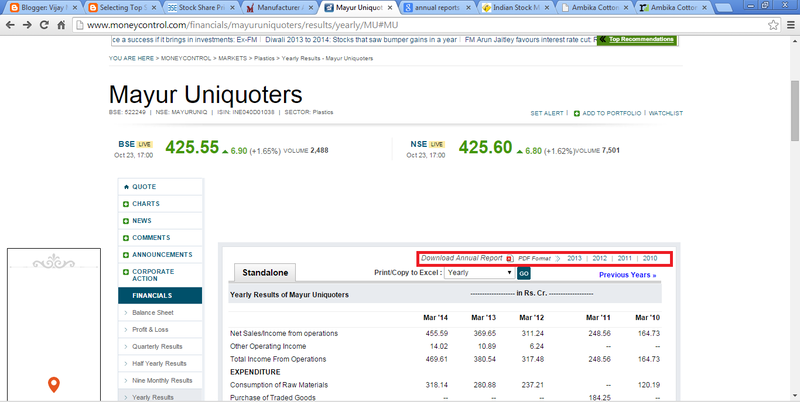 We can see that in FY2013, MUL generated Rs. 2,723.54 lakh (Rs. 0.27 billion) of cash from operations and raised Rs. 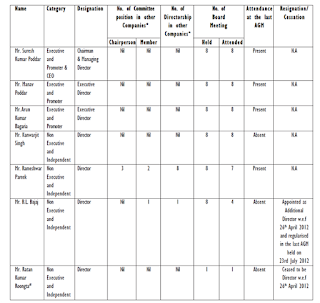 766.70 lakh (Rs. 0.07 billion) of cash from financing and used it for investing Rs. 3,586.26 lakh (Rs. 0.35 billion) in assets of the company. Thus, we can observe that MUL has funded most of its investments in FY2013 from its operations (aka internal accruals), which is a sign of healthy growth. Thus we get to know the details of the lenders, their respective loan amounts, repayment schedules and the security offered for different loans availed by company from its lenders. 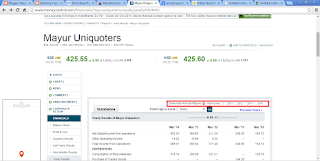 We can see that the company has invested Rs. 1,493.94 lakh (Rs. 149.3 million) in current year, which was mainly invested in building & premises and plant & equipment. It indicates that the company is probably investing in a new manufacturing unit. If we see the figures for previous year in the last row, then we realize that last year the company had invested Rs. 1,772.80 lakh (Rs. 177.2 million) in its assets. This gives an investor an indication that the company is in the expansion phase and continuously investing in assets. Schedules/Notes are very important and should be studied with patience and due care. Quality of schedules is an important reflection of the quality of management of the company. Warren Buffett says that if you are unable to understand the notes, it is because the CEO does not want you to understand them. A lot of information/financial jugglery is often hidden in schedules. Every company is required to disclose every transaction it enters into with its promoters and other related entities. A careful analysis of these transactions can reflect whether the promoter is using different transactions to transfer money from the company to itself. We should look at the transactions between company and promoter owned entities (POE, enterprises over which promoters are able to exercise significant influence). Presence of transactions like interest free loans to POE, taking assets owned by POE on lease/purchase at prices higher than market value are some of the examples by which we can get a sense of promoters who are taking out funds from the company and gaining at the cost of minority shareholders. Thus, we can see that the annual report is one such document that can throw light on the status of the company, provide information to gauge its potential of future growth and provide insight on the character of the management of the company. It is single most important document that every investor should read. 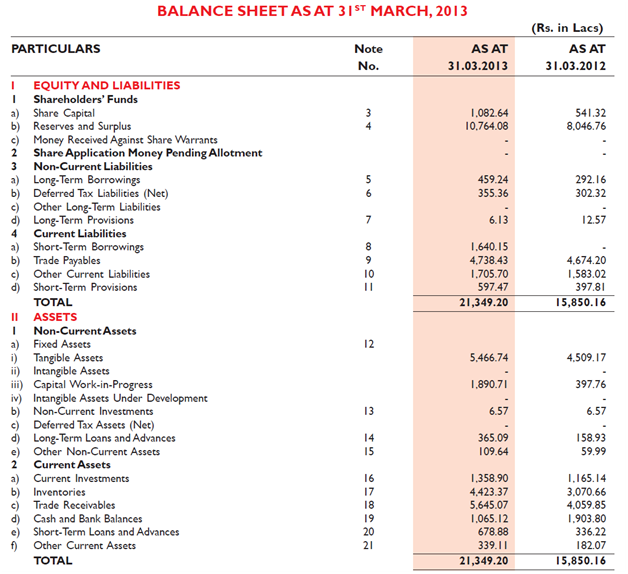 How to analyse financials upon change from accounting method from Indian GAAP to IFRS (Ind AS)? I was trying to analyze and compare pre- and post-FY2016 financial statements of a company and found many figures different. As I understand, this is because of the change in the accounting standards from previous Indian GAAP to Ind-AS. Therefore, this essentially makes them incomparable. What is a better way to compare last 5-7 years of financial statements since the standards, and hence figures, have changed? Even financial ratios would be incomparable. Companies provide the reconciliation of change in financial data from GAAP to IFRS in the annual report of the year in which they have started reporting financial data as per IFRS. 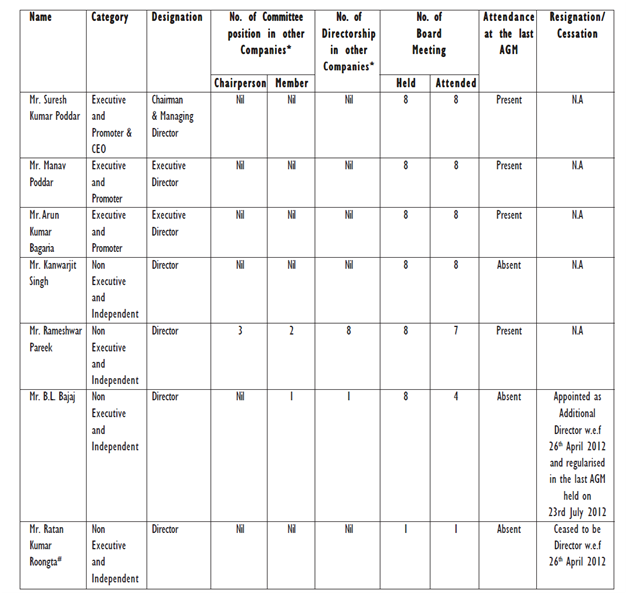 For example, if a company has published its financial data as per IFRS in FY2018, then in the FY2018 annual report, it would disclose multiple tables, which will show the numbers as per GAAP in the first column, the changes after adoption of IFRS in the next column and then the final numbers as per IFRS in the last column. 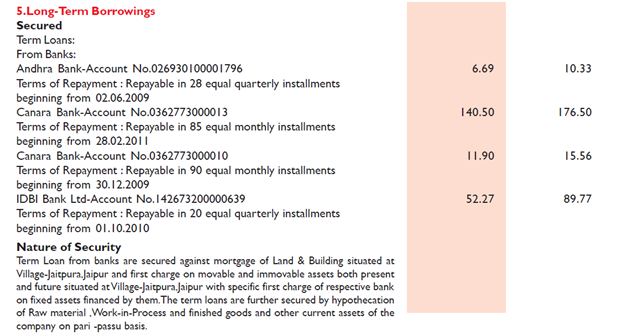 In case of Mahanagar Gas Ltd, when an investor reads the FY2017 annual report, then from page 139 to page 143, the company has detailed the impact of Ind AS on its financials. The company has provided the reconciliation of its financial statements from earlier accounting standards (Indian GAAP) to new accounting standard (Ind AS, IFRS) including the reconciliation for balance sheet (page 140), total equity, profit and loss statement (page 141) and total comprehensive income (page 142). Therefore, we suggest that investors should read the annual reports in detail to understand the transition of financial data from GAAP to IFRS. If upon reading the transition data in the annual report, an investor still has some queries, then she should contact the company directly for clarification/additional information about the reconciliation data. Comparison of the new financial data with the past financial years will differ from case to case. An investor should first understand the transition of financial numbers from GAAP to IFRS for any year by reading the annual report in detail. After looking at the extent of difference in the GAAP and IFRS numbers, investor may herself decide whether the IFRS financial data for the company is comparable with the previous year’s GAAP data. If the differences are small, then investor may continue to use sequential comparison. Otherwise, she may refrain from doing it. In a nutshell, the essence is to first read the annual report to understand the transition/reconciliation of GAAP and IFRS financial numbers and then decide whether to do the comparison with past years or not. 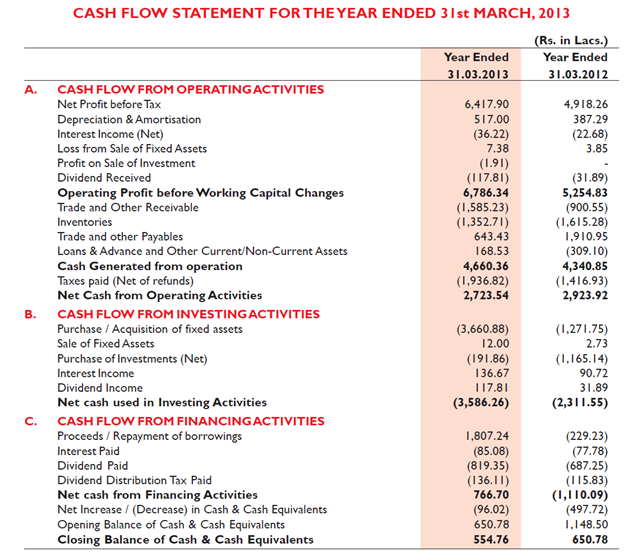 In the cash flow statement, the dividend column is blank in cash flow from financing activities. Therefore, one can assume, they have not issued dividends this year. Based on the Company’s performance, the Directors are pleased to recommend for approval of the members a dividend of ₹2.50 per equity share of ₹10.00 each (i.e. 25%) for the financial year 2016-17, to be paid on total equity shares of the Company. The dividend on the equity shares, if approved by the shareholders, may involve an outflow of ₹727.79 Lakh towards dividend and ₹148.16 Lakh towards dividend tax, resulting in a total outflow of ₹875.95 Lakh. Moreover, many companies do not show any liability of dividend declared by them in the balance sheet. Whys is it so? Please clarify. Thanks for writing to us! It is great that you are reading the annual reports line by line and making insightful observations. Such effort is commendable. A dividend outflow is shown in the cash flow statement only after the company pays the dividend amount to its shareholders by cheques/DD or by online bank transfers. Until the dividend money goes out from the company, it will not show in the cash flow statement. Under the previous accounting standards, Indian GAAP (IGAAP), the unpaid dividend amount used to be shown as a current liability by the companies during the period between declaration of the dividend and the actual payment to shareholders. However, since the adoption of new accounting standard based on IFRS (Ind AS), this practice has undergone changes. As per IndAS, unless a dividend is approved by the shareholders, it cannot be shown under liabilities. In the previous accounting standards, the companies could show dividend under liabilities at March 31, 2017, before the shareholders approved it in the AGMs in July/Sept 2018. However, now the new accounting standards direct that dividend cannot be shown as liability unless shareholders approve it. Therefore, now we do not find any mention of the dividends declared by the board but unapproved by the shareholders, anywhere in the financial statements. Now a day, the annual reports contain information of such dividend declarations in the Directors’ Report only as a paragraph without creating any liability in the balance sheet. I have a doubt regarding a company that I was analysing. 1) In the notes to the financial statements section, there is a note for ‘other long term liability’ under which there is one entry called ‘security deposits’. What is this? There is another ‘security deposit ‘ in the ‘other non-current assets’ section. 2) What is the trade receivables for a hospital? How can a hospital give its services to customers (patients) for credit? The deposits that a company has received from its customers/vendors are shown under liabilities. The deposits that the company has paid to service providers etc. like security deposit paid to the owner of a building, which it has taken on rent for office/factory is shown under assets. 2) A hospital may have trade receivables from insurance companies if the insurance companies take some time for payment to hospital after claim is approved. The hospital may also have receivables if it has a tie up with any corporate for treating their employees. The employees may take treatment today and their employer may settle the bill after some time. As per your recommendation, I am reading annual reports of multiple companies. However, I am facing challenge to understand the language. Most of the companies write cooperate language, which I find difficult to understand as I am from science background. Is there any best way to understand the annual reports? The best way to learn about business language is to read many annual reports, which you are already doing. Therefore, you are on the right path. Whenever an investor comes across new terms, then she may use Google/Investopedia etc. to refer to find the descriptions of these terms. Moreover, with time and reading more annual reports, the strange terms will start becoming familiar. As a result, the time to read future annual reports will decrease drastically. At our website, we have covered many accounting terms in our articles. Therefore, whenever you come across any new terms, then you may use the search feature of our website to see if there is already an article on that term on our website. More of a behavioral question. Every day, I try to read about the processes and books related to investing or the blogs. But when it comes to reading the annual report or doing the fundamental analysis of any stock, I somehow lose patience or I find it very boring or I am not able to find it exciting and skip over some sections. Reading annual report is not a choice but a necessity for any stock investor. An investor needs to understand this fact. If she is not reading annual reports, then knowingly or unknowingly she is hurting her development as an investor. I am privileged to be associated with you as I am subscriber of your premium service “Workshop on Demand”. What is an unclassified share? What is reclassification of an unclassified share? Why do companies reclassify an unclassified share? What are the benefits to the promoter from reclassification of unclassified share? What are the benefits to the investor from reclassification of unclassified share? Companies have an authorized capital, which they use to issue equity shares or preferred shares. Unclassified shares (US) are that part of authorized capital, for which it has not yet been decided whether they will be issued to investors as equity shares or preferred shares. Once the company decides, whether to use US as equity shares or preferred shares, then this is called reclassification. It’s only upon reclassification of US into equity shares or preferred shares that they can be issued to other investors like an IPO or FPO or private placement. Unclassified shares (US) provide an option to easily issue equity shares or preferred shares, when the company needs to raise money as the company can do the reclassification of US and issue these shares to investors as it wants. The benefit to promoters, existing investors or the company seems the presence of choice to use the same share capital (US) for equity or preferred shares. As per our experience, unclassified shares are not seen as a very common occurrence in the companies. At the end of the day, if a company wants to raise money, then it will in any condition complete the necessary compliance procedures to issue new shares whether it has unclassified shares or not. Therefore, we do not believe that the presence or absence of unclassified shares has a huge impact on investment decision. Future articles in this series would build upon the understanding of annual report to further the discussion on financial, business & industry, management and valuation analysis of companies. We would learn in detail about the concepts and parameters of such analysis by applying it to analysis of a sample company. I would be happy to learn about your feedback on this series of articles and your learning from reading of annual reports. You may share your inputs in comments section below.